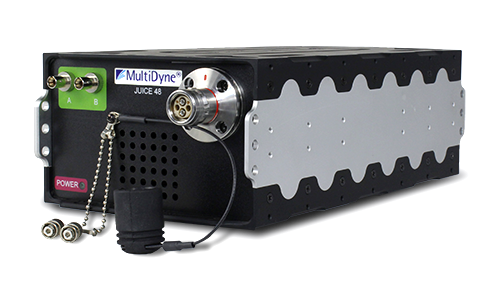 MultiDyne’s Juice-48 is a robust portable power supply, allowing users to send signals from the camera up to 300 meters without the need for local power or batteries. It can be built into the camera base stations 1-RU frame or housed separately. When built into the base station, it enables simple plug-and-play operation and delivery of up to 100 watts of power to 300 meters. When used externally (pictured), the system increases user flexibility with regards to where the power can be located, enabling a wider range of cabling topologies and transmission distances to be realized. Pairing any of the MultiDyne SilverBack camera-mounted transceiver products with Juice transmits any camera signal, including HD-SDI video, audio, intercom, control data, GPIOs, tally, and power, making it the perfect solution for news, sports, ENG, D-SNG, OB, and multicamera studio applications.